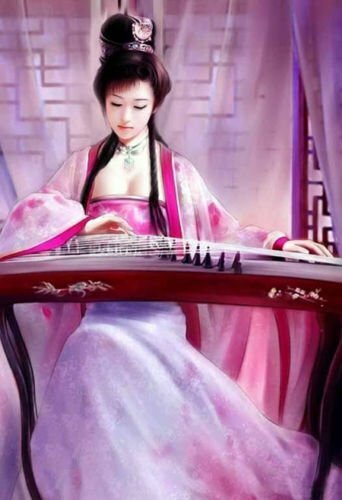 The guzheng or Gu Zheng is a Chinese string instrument. Sometimes the name is shortened to zheng. No matter what you call it, the large, slender instrument functions as a plucked zither with 18 or more strings and movable bridges. 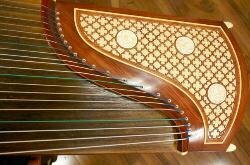 According to musicologists, the guzheng was inspired by early bamboo tube zithers. Today’s guzheng is quite different from the instruments made centuries ago. Modern players use picks–called DaiMao–which are often made from hawksbill turtle shells. Ancient picks were carved from ivory or tortoise shells. Western musical styles have inspired a more modern playing technique where the left hand is used to provide harmony and bass notes. This allows for greater flexibility in the instrument’s musical range, but tends to limit subtle ornamentations provided by the left hand in more traditional music. Students at the Beijing Conservatory are required to learn a repertoire of both traditional and modern pieces. Here are a few more interesting guzheng facts. Centuries ago the strings were made from silk. Today they’re nearly always metal-nylon, which increases the instrument’s capabilities, volume, and timbre. The strings are capable of creating graceful sounds that mimic a cascading waterfall, or stronger sounds like thunder and trotting horses. Indeed, well known pieces for the guzheng suggest a connection to nature. For example, Yu Zhou Chang Wan (Songs of Fishing Boats at Dusk), Gao Shan Liu Shui (High Mountains Flowing Water), and Han Gong Qiu Yue (Autumn Moon Over the Han Palace). A person who performs on this string instrument is called a guzhengist or Chinese harpist. Notable guzhengists include Bei Bei He, Shirley Wang, Melody Yan, and Wang Zhongshan. We’ve created more than 2,500 products for string instrument players and music lovers. Find a unique gift for your favorite guzhengist. Keep an eye on this automatically updating gallery of guzhengs and accessories available on eBay. Find bargains on all kinds of string instruments including guzhengs.